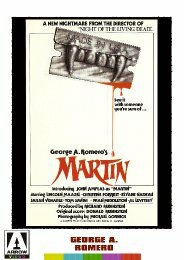 Writer-director George A. Romero's personal favourite of his own movies, Martin is a genuinely disturbing horror film that turns the traditional conventions of the vampire myth inside out and one which, at the time of its original release, reinvented the vampire movie genre. Now, Romero's masterpiece comes to DVD as a special two disc release courtesy of Arrow Video featuring the original theatrical cut of the film (with 5.1 and Stereo audio options plus a choice of 16:9 and the Romero-recommended 'Academy' 4:3 aspect ratio presentations), the Italian cut of the film (reputedly edited by Dario Argento) and featuring music by Goblin, plus a host of other extra features. Despite a lack of fangs, and having no aversion to daylight, garlic or crucifixes, insecure teenager Martin believes he is actually an 84-year-old vampire compelled to drink the blood of humans in order to survive. Martin's belief is reinforced by his elderly uncle, Cuda, with whom he is sent to stay to work in his Pittsburgh grocery store. Cuda is convinced vampirism is part of their family curse and refers to Martin as 'Nosferatu', employing ineffective Old World defences in an attempt to keep the teenager at bay. 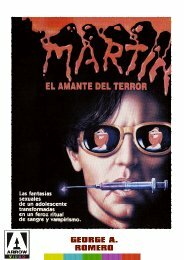 Driven by his insatiable blood lust, the frustrated and confused Martin is forced to kill and feed, first drugging his victims to reduce their suffering before opening their veins with a razor blade. However, his inhuman desires are almost overcome when he begins an affair with a desperate older woman and he starts to question the validity of his self-belief. An intelligent, modern day story of addiction, sexuality, and obsession given a unique vampire twist, Romero's film begins with a typically shocking opening scene that perfectly sets the tone for what is to come. Romero regular John Amplas (Creepshow; Day Of The Dead) gives an astonishing, sympathetic performance as the eponymous anti-hero, starring alongside the real-life Mrs. Romero, Christine Forrest (Dawn Of The Dead; Knightriders; Creepshow; Monkey Shines; The Dark Half), make-up wizard Tom Savini, and, as an ineffectual priest, the director himself. 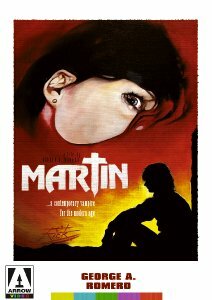 Hugely underrated at the time of its release, Martin has now come to be accepted by many critics and horror fans as Romero's finest work to date. Martin (cert. 18) will be released on DVD (£15.99) by Arrow Video on 21st June 2010. Special Features include: the original theatrical cut of the film with 5.1 and Stereo audio options plus a choice of 16:9 and 4:3 aspect ratio presentations; 'Wampyre' - the Italian cut of the film, featuring Italian dialogue (with optional English subtitles) and musical score by Goblin; 'Making Martin: A Recounting'; Documentary on George A. Romero; TV and radio spots; original theatrical trailer; photo gallery; four sleeve art options; double sided poster; exclusive collector's booklet; six original poster art postcards.